OS X Continuity Activation Tool is designed to do exactly what the name itself suggests; to enable Handoff, Instant Hotspot, and AirDrop features on older Macs that do not support it. This tool will make sure you are not left out of Apple’s finest feature in a long time. When Apple’s Continuity feature first went live with the release of OS X Yosemite and iOS 8.1, Mac and iPhone users went ecstatic at the prospects of having a go at it. That was until users realized that the Bluetooth LMP version of a Mac should be 0×6 to support Continuity features. So while Apple decided to not support all Bluetooth 4.0 capable Macs for Continuity in OS X Yosemite, it turned out that with some manual tinkering users could enable said feature for unsupported Macs. 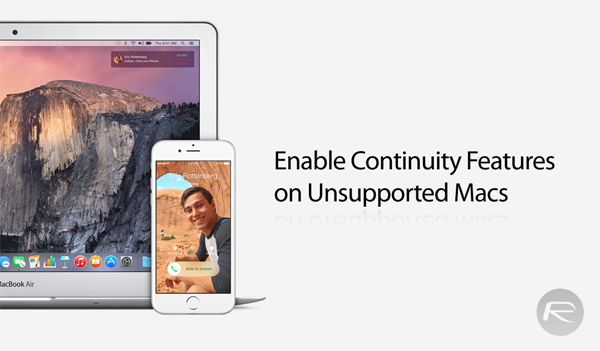 OS X Continuity Activation Tool, does just that – only it’s automated, easier and faster. How does it do that? To quote the developer, it “Does a Continuity compatibility check, backups the original Systems kexts, disables a Mac-model blacklist in the Bluetooth kext, whitelists the Mac board-id in the Wi-Fi kext.”, and then, “Produces a report of the current system parameters influencing Continuity.”. It’s worth noting that the tool may not work for all users, but only Macs with built-in Bluetooth 4.0 are supported. If your Mac doesn’t have Bluetooth 4.0, you will need to first upgrade the built-in hardware. And no, Bluetooth dongles won’t work with this. The developer has listed down the supported Mac models, along with the necessary hardware changes, if any are required. If you see your Mac in the list, and want to give it a go, here’s how to do it. Be warned, that if you have previously attempted a Kext Mod Application to modify the kexts on your Mac, you need to reset all changes to original settings before attempting to run this tool. Step 1: Download OS X Continuity Activation Tool from here. Step 2: Extract (unzip) the downloaded file. Step 3: Run the app, and follow all on-screen instructions. Ignore or deny any “Access to accessibility features” prompt that you may come across. Does the activation tool do the trick after i replace the wifi card or do i have to do anything before trying? It worked on my mid-2011 Mac Mini. Hmmm I have a mid 2011 MacBook Air. Ran the patch and . . . nothing. 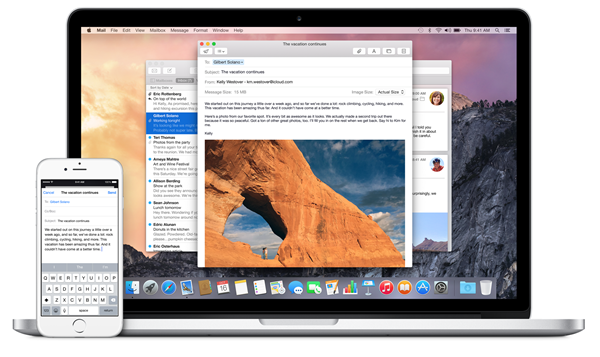 If I start an email on my 6 Plus, I should see it available on the Macbook Air correct ? i have a mac mini mid 2011, and a macbook pro mid 2010, can i interchange the wireless cards among the two, as usage is 10 times more on pro, and mini is just my media center on my television? What about the Macbook White Unibody (late 2009)? Is it possible that shares the same hardware with the MacBook Pro (mid 2009)? Might there be a chance to get this working on an early 2008 Macbook Pro (last non unibody)?? I love my old macbook pro and this the only thing thats missing. If you get handoff working on your equipment, VisuLauncher is good handoff companion app for your iPhone to scan websites, email addresses, phone numbers, map addresses and launch an appropriate app on your phone. You can then continue “on the big screen” on your Mac. A BCM94331PCIEBT4CAX does NOT fit in my MacBook Pro 15“ Mid 2009!